Calls an in-game vote for the next map near the end on the round. Randomly selects four maps (by default, can be adjusted) from the current maplist to vote on. Before the options are displayed, a banner can be shown to get the players attention that voting is about to commence. The votes are tallied and if there are more votes than the set threshold, the winner is the map with the most votes. If there is a tie, the winner is selected at random from the tied maps. The next map is announced and it can be periodically displayed until the end of the round. Four displayed voting options without gamemode showing. Also shows vote confirmation message. Optional voting banner used to get the attention of players before/during a vote. BF3: Unzip the 'xVotemap.cs' into your '..\Plugins\BF3\' folder. BF4: Unzip the 'xVotemap.cs' into your '..\Plugins\BF4\' folder. /# While a vote is in progress, votes for the option represented by the #. /v Displays the vote options while a vote is in progress. If typed before a vote, it will display the predicted amount of time before the vote begins. /nextmap Displays the next map. /votemap Initiates/restarts a votemap if the player has map changing priviledges in Procon. enablevotemap Enables the votemap plugin if the player has map changing priviledges in Procon. disablevotemap Disables the votemap plugin if the player has map changing priviledges in Procon. Enable Vote Banner? : Is the banner (designed to get the attention of players) displayed before the voting commences. 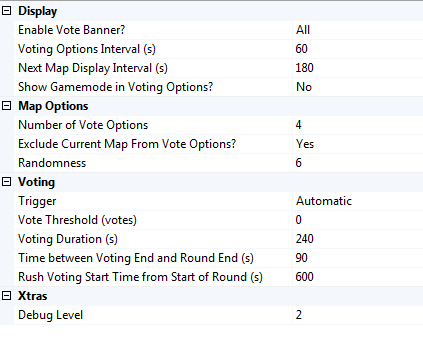 Voting Options Interval: Integer, in seconds, representing how often the map vote options are displayed once the voting poll opens. Next Map Display Interval: Integer, in seconds, representing how often the winning next map is displayed after the voting is over but the round hasn't ended yet. A value of -1 will disable nextmap messages. Show Gamemode in Voting Options? Determines if the shorthand notation for the gamemode is displayed in the voting options. This is most useful for those running mixed mode servers, especially if the same map is in the maplist with different gamemodes. Number of Vote Options Integer, between 2 and 8, representing the number of vote options to be displayed when a mapvote is called. Exclude Current Map From Vote Options? : If yes, the current map with be excluded from the next map voting options, so to not allow the same map to be played twice. 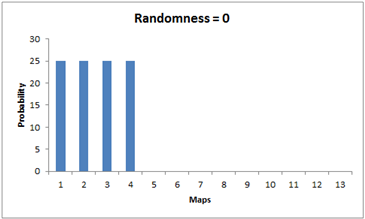 Randomness: An integer from 0 to 10 representing the randomness of the map options for a vote. The algorithm changes the probability of each map and gamemode pair being selected as a vote option depending on how long ago it was last played. Randomness = 0: Will rotate through the maplist, only showing the maps that haven't been played in a long time. Players should end up playing every map in the cycle. Randomness = 5: Maps that haven't been played in a long time will have the highest probablity and recently played maps will have the lowest probability of being selected as vote options. 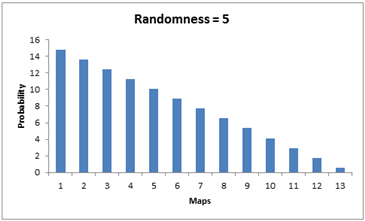 Randomness = 10: Every map has the same chance of being selected as an option. Players will tend to play the most popular maps repeatedly. Trigger: If Automatic, the voting will be triggered automatically near the end of the round. If Manual, the voting will have to be triggered manually with the /votemap command. Voting Threshold: Integer, representing the minimum total number of votes that must cast for the highest voted map to become the nextmap. If no map reaches this threshold, then the map will just roll over to the next map in the maplist. Voting Duration: Integer, in seconds, representing the target length of time the voting poll is open for. Time between Voting End and Round End (Conquest): Integer, in seconds, representing how long from the end of the round the voting will finish. In other words, at what time you want the voting to take place, mear seconds before the end of round or in the middle of round sometime. Voting Start Time from Start of Round (Rush and Defuse (Elimination)): Integer, representing the time when voting will start, in seconds from the start of the round. In rush, there is no way to predict when the round will finish with the current RCON information, as the status of MCOMs are unknown. So you must estimate how long the shortest rush round would take and start the vote a couple of minutes earlier in order to ensure a vote will take place. Debug Level: Integer between 0 and 5, where 0 outputs no plugin debug messages, and 5 which outputs even the most mundane steps. If the maplist is changed during a vote the winning map will not correctly be the next map. NEW: New gamemode Chain Link (Dragon's Teeth DLC) is now supported. Fix: added missing gamemode [CA] (CarrierAssaultSmall0) to vote options. Fixed: show maps only once if they are double in maplist. Fixed: /votemap to start a map vote. Added: In-game enable and disable. Fixed: Mapnames fixed from patch. Fixed: Maplist sort for 'Map Only' and 'Gametype Only'. Will still work on a better algorithm too. Added: Information link with Ultimate Map Manager to ensure the voted map will be the next map if the maplist needs to change and it is still in the maplist. Fixed: Remove current map bug. Added: Improved map options display. Should reduce the chance of very long options. Fixed: Gamemode should appear throughout the in-game message, if turned on. Added: Ability to disable vote results from being displayed. Added: Option to change the way the maplist is sorted. Added: Option to display the nextmap before the vote. Added: Option to set minimum and maximum player count limits for if the vote will take place. Change: Renamed to xVotemap. Delete old CxVotemap. Fix: /votemap command now works on all rounds. Fix: Between rounds error bug. Fix: Votemap starting too early. Fix: Several bugs that were in the new randomness code. A lot of console debug text has been added, most will be removed or suppressed when this version is proved stable. 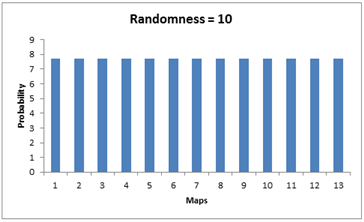 Added: Randomness, a new algorithm to decide which maps are chosen to be vote options. Added: Ability to disable votemap starting automatically. Last edited by grizzlybeer; 15-07-2014 at 17:47. Nice, giving this a try! I'm getting an error showing up... it seemed to be running okay when the server was full with 64 people on conquest, then we had a server crash and it went back to the first maplist, which are all TDM maps. [20:40:40] Running with native .Net..
[20:40:40] Compiling and loading plugins..
[20:40:43] [xVotemap] Info: Not last round. Stopping voting system. [20:40:43] [xVotemap] Error: Object reference not set to an instance of an object. [20:42:47] [xVotemap] Info: Not last round. Stopping voting system. [20:42:47] [xVotemap] Error: Object reference not set to an instance of an object. [20:43:16] [xVotemap] Info: Not last round. Stopping voting system. [20:43:16] [xVotemap] Error: Object reference not set to an instance of an object. [20:43:31] UltimateMapManager: TASK -> 0 players. Need to change to Map List 0 [Deathmatch]. [20:43:31] UltimateMapManager: WORK -> Changing to Map List 0 [Deathmatch]. [20:43:47] [xVotemap] Error: Index was outside the bounds of the array. Yell is working in BF4? For me this has worked perfectly. Now I will test the layer. Hey grizzly im not seeing the modes in procon for shorthand so people know what type of map they are voting for .. the new modes like what i added in my earlier version . (OB) and (DF) . right now it just blank no mode listed . my edits fixed that problem . maybe we can add those back in? [16:46:09 36] [xVotemap] Info: Voting Ended. 3% of the players voted. Last edited by grizzlybeer; 01-11-2013 at 21:33.